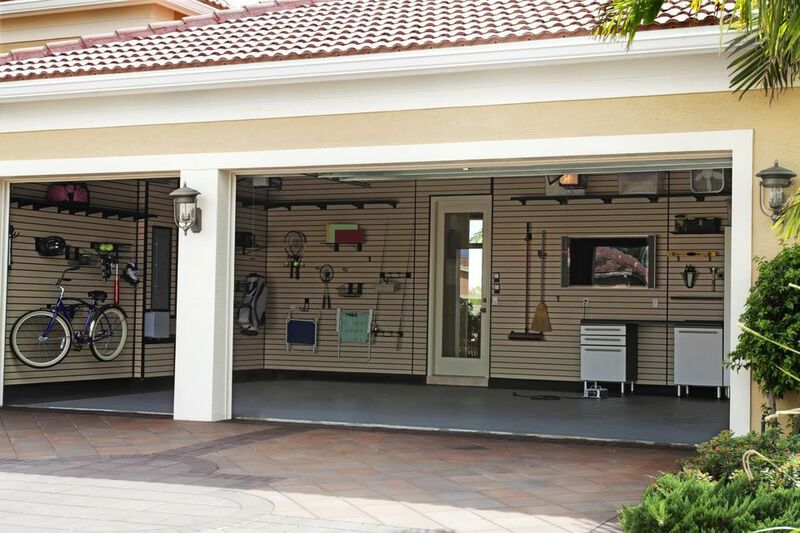 Everyone appreciates and benefits from having a neat, clean, and nicely organized garage. The key to getting there is taking a systematic approach. Here are some tips that are sure to make any garage easier and safer to use and enjoy. Almost nothing promotes a clean, safe, and well-organized garage like developing the habit of keeping the floor as clear as possible. Use hooks, racks, cabinets, and shelves to hold stored goods. Stackable containers are available in sizes to fit most any storage need or storage space. Use clear plastic containers or label the fronts of each one for easy recognition. Items that will be used regularly should be stored within reach, but little-used stuff, such as holiday decorations, can be stored in shelving attached high on the wall. Use a stepladder for access. Wall-mounted grid panel systems are affordable and easy to install. Once the main panel sections are anchored to the wall, you can attach baskets, hooks, shelves, and other available accessories to tailor the setup to your specific needs. Pegboard (perforated hardboard) is an inexpensive material that can substantially expand your storage options. Attach the pegboard to spacers (typically 1x2 wood strips) that hold it away from the wall enough for hooks to be inserted and removed. Use 1/8-inch pegboard for light items and 1/4-inch pegboard for heavier items. Buy a supply of hooks, tool holders, shelf holders, and other hardware made specifically for use with pegboard. If the walls of your garage have exposed studs, build shelves to fit in the cavities. Cut 1x4s to serve as shelf supports, and attach them to the studs with screws or nails. Then, cut 1x4s to span the cavity and set them on the supports. Long items, such as brooms and skis, can be stored safely between studs by attaching 1x2s horizontally across the studs to hold the items in place. Garages are usually full of potentially dangerous items, such as sharp objects and toxic or flammable liquids. Keep these items out of reach of children. Store toxic and flammable materials in suitable containers that are clearly labeled; never store them in glass containers, which can break and spill the liquid, or in ordinary plastic containers that can deteriorate. In small garages, or for occasional use, it doesn't make sense to tie up precious space with a permanent bench or work table. The alternative is to build a folding table. Attach the table to the wall with hinges screwed to a 2x4 fastened horizontally to the wall studs. The table can fold up or down. A light-duty table can be held in place with chain and hooks, or you can fasten pipe flanges to the bottom and use removable threaded pipes as temporary legs. Keep items used for the same task (gardening or carpentry tools, sports equipment, camping gear, painting supplies, etc.) together. That way, you will know where to look when you need something. The overhead space of most garages offers a lot of valuable storage real estate. Take advantage of it with overhead racks, shelving, or even a storage attic. Most units hang from the ceiling alone or from the ceiling and an adjacent wall. Some use pulley systems that let you load and unload items without a ladder.